Be Kind, Be Respectful, Be West Brook! Welcome to the Internet home of the West Brook Middle School Wildcats. 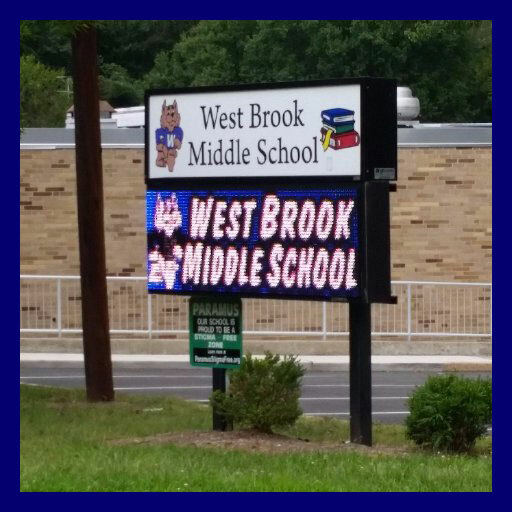 At West Brook, in the Paramus Public School District of Paramus, New Jersey, we provide a safe, empowering learning environment for fifth through eighth grade students. Thank you for taking the time to visit our website. We are happy to provide you with information about our school and the excellent programs and services we offer our students. Go, Wildcats! At our close-knit school, we’re very proud of our students and their accomplishments. Our dedicated staff members work hard every day to bring the best learning opportunities possible to our student body. We encourage parent involvement in all our school events. We will continue to challenge our students with a rigorous curriculum as well as provide them the opportunity to become productive and successful American citizens in a complex, rapidly changing, competitive technological and global community. The West Brook educational program is grounded in the continuing partnership of school and home. Together, we can make all children successful. My door is always open to you. Please stop by if you ever have any questions. West Brook fifth graders worked together to create their digital citizenship pledges with Mr. Rembecky. The Paramus School District will be administering the New Jersey Student Learning Assessments in ELA and Mathematics (NJSLA-ELA and NJSLA-M), formerly known as PARCC, beginning May 6, 2019, for grades three–eight. Congratulations to Mrs. Dugan on her achievement of winning West Brook’s 2019 Teacher Recognition Award! Everyone enjoys music, whether by listening to it, singing, or playing an instrument. The New Jersey Department of Health and Senior Services has mandated that children born on or after January 1, 1997, and entering grade six, shall have received one dose of each of Tdap (Tetanus, diphtheria, acellular pertussis) and Meningococcal vaccine. We really love all of the beautiful Japanese Poetry Tanka! Thank you, Ms. Burke! Our students recently had a great day in Star Lab! They looked for notable stars, star patterns, and movement. We are very proud of our good citizens this month. Our students continue to impress us! Students recently used Story Cubes to write creative short stories.